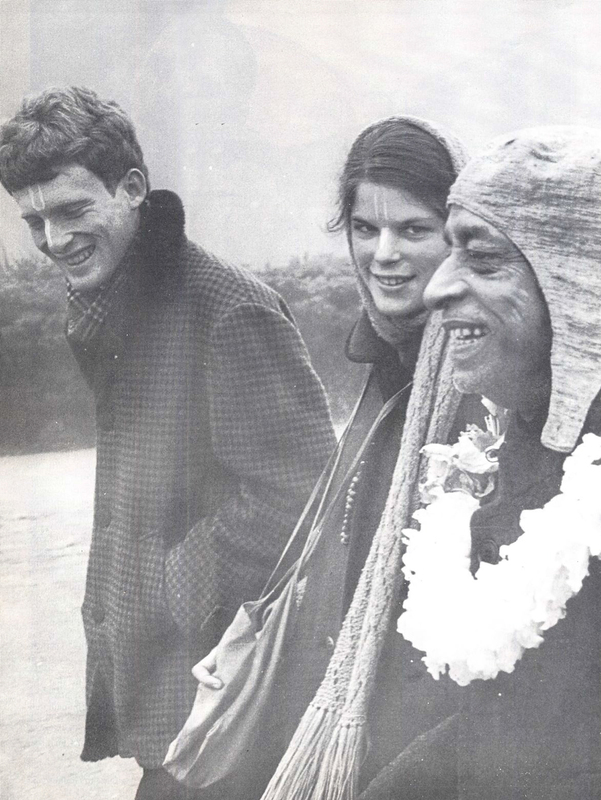 [Note: The following is a reminiscence by one of Srila Prabhupada’s first students in the West. This section, from the book The Hare Krsna Explosion, intimately traces the beginning of the Krsna movement in New York City in the summer of 1966]. It was in August also that we began taking prasadam (food offered to Krsna) at noon in Srila Prabhupada’s room in the back apartment. Kirtanananda was beginning to cook at this time under the personal instructions of Srila Prabhupada. He was the first cook, and in the beginning Stradisa assisted him and then Achyutananda (though no one at this time was formally initiated). 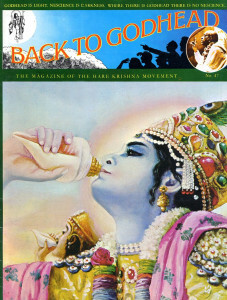 Later Srila Prabhupada told me that at the time he was wondering whether American boys would like prasadam. He would laugh at this because prasadam turned out to be one of the most successful parts of our program. At first, all of the prasadam was put on one plate, which was Srila Prabhupada’s. It consisted of only dahl (split pea), some rice and curry, and chapatis (unleavened bread). About twelve of us, all male, would sit along the wall of his apartment and wait while Srila Prabhupada personally took the food off the plate and distributed it individually, reciting, “sarira avidya-jala jadendriya tahe kala” etc. We would recite each word after him and pass the plates around. He translated this prayer for us in this way: “This material body is a lump of ignorance, and the senses are networks of paths to death. We are fallen into the ocean of material sense enjoyment. Of all the senses, the tongue is the most voracious and uncontrollable. It is very difficult to conquer over the tongue in this world, but Krsna is very kind to us. He has sent us very nice prasadam to conquer the tongue. Now let us take that prasadam to our full satisfaction and glorify His Lordship Radha and Krsna and in love call for Lord Caitanya and Nityananda to help us.” At first, each of us would only take one chapati each, and when Srila Prabhupada asked if we would like more, we would say, “Oh no! That is enough. That is sufficient.” Later he often laughed at our initial reluctance to take more. It was Stradisa, a very tall thin boy, who started eating more and more chapatis due to Srila Prabhupada’s insistence. He finally averaged ten a meal. Then gradually our appetites also picked up, and as more people started coming to eat in Srila Prabhupada’s back apartment, we began taking our noon prasadam downstairs in the temple while Srila Prabhupada ate alone upstairs. It was a wonderful sight, though, to see the spiritual master and all his disciples—around a dozen young men, all very young, no one over thirty—sitting on the bare floor at noon eating. We might have been in New York, but it didn’t seem like it. Both Kirtanananda and I were reminded of Calcutta. I liked Srila Prabhupada’s food much better than the Calcutta fare, however, and though I didn’t eat very much, I felt full and satisfied. “I don’t know,” I said. I really didn’t know; it never crossed my mind. The next afternoon Allen came over to visit Srila Prabhupada in his back apartment. He brought a little harmonium, which he had picked up in Benares, and chanted Hare Krsna. The tune was different, very, very jolly, and Allen’s head bounced back and forth as he pumped the rhythm on the tiny reed instrument. Then Srila Prabhupada began to explain Lord Caitanya’s philosophy. I remember Allen asking him if he planned to make his American boys into Vaisnavas, and Srila Prabhupada said, “Yes, and I will make them all brahmanas.” “Brahmanas?” Allen said incredulously. He was amazed that Srila Prabhupada was intending to establish the varnasrama-dharma in America. He wished him good luck and gave a contribution. It was at this time that we started to decorate the temple. Although for any New Yorker it was just a bare, squalid storefront, the kind somebody might open a pawn shop in, it became a temple for us because of Srila Prabhupada’s presence and because of the words that were spoken there. When Kirtanananda and I returned from India, we brought back some two dozen paintings, rugs and large silks with which we had decorated the Mott Street apartment, and now we took all of this out of the apartment and over to the temple. Others donated curtains and a large rug, and we spent all day tacking the silks on the wall, putting up the curtains, fixing an elevated dais for Srila Prabhupada, painting the walls and laying the rugs. Someone had painted an oval portrait of Radha and Krsna modeled after the jacket of Srila Prabhupada’s Srimad-Bhagavatam. We hung this up over the dais. In front of the dais we placed candlesticks, which we also brought from Mott Street. Then down the walls we placed pictures. Later Srila Prabhupada informed us that one of the pictures of a six-armed Deity was Lord Caitanya. That night, when Srila Prabhupada walked in to begin kirtana, he looked at the newly decorated temple and showed surprise. “Ah, you are advancing,” he said. “This is very nice. 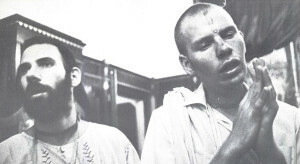 This is Krsna consciousness.” He then sat up on the new dais, and we all held our breaths hoping it wouldn’t collapse. Some of the hypercritical took exception to the dais, to the fact that Srila Prabhupada was elevated, and some others, being reminded of the Catholic or some other organized church, resented the temple decorations, especially the candlesticks and the incense. They longed for the days of the bare walls and bare floor. These fears were dispelled, however, at kirtana when Srila Prabhupada taught us how to dance, raising his arms in the air and placing one foot before the other. We followed him and danced in a circle. At this time, we were also beginning to play more instruments. A boy named Nelson donated a large cymbal, which was hung on a cord beside the dais. Srila Prabhupada played it softly from time to time while leading the kirtana. We were also using brass hooka tops for bells and would ring them when the kirtana became more fiery. Kirtanananda and I finally sold the hookas, which were the last remnants of our India trip. And in order to put this into practice, Srila Prabhupada had to engage us in so many ways. I remember one of the members tacking a sign on the bathroom wall: “If you are not always engaged, you will fall into maya. ” And by way of engaging us, Srila Prabhupada accompanied us out to Long Island to look at used mimeograph machines, of which we purchased two at $75 each. I then started typing up stencils for two of his essays, “Krsna the Reservoir of Pleasure” and “Who is Crazy?” Srila Prabhupada also had me write a “Prospectus,” which someone was financing. I felt I didn’t know enough about Krsna consciousness to write a prospectus, but Srila Prabhupada told me, “Do it,” so I ran back to Mott Street and quickly jotted down my conceptions of Krsna consciousness. How I managed the first statement is still a mystery to me. “Krsna consciousness has been variously called cosmic or expanded consciousness,” I wrote. 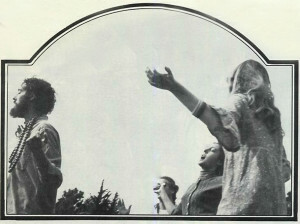 “In part, it is the moment to moment awareness that man is a segment of the creation which is the eternal Song of God, that this creation emanates from and is sustained by the One without a second, the manifest Godhead, that the creation is not chaos and disunion as this desperate and atheistical age would have us believe, but is union, order, and plan, that as the planets orbit in orderly procession about the sun and the sun moves in perfect motion within its galaxy, which in its turn follows the path down the grand open road of space, so man, by God’s grace and willing co-operation, makes his way back to the Godhead.” Srila Prabhupada added to this five main purposes of the International Society for Krishna Consciousness, which were: (1) to systematically propagate spiritual knowledge to society at large, (2) to propagate Krsna consciousness as revealed in Bhagavad-gita, (3) to bring the members of the Society together and nearer to Krsna, (4) to teach and encourage the sankirtana movement, congregational chanting of the holy name of God as revealed in the teachings of Lord Caitanya Mahaprabhu, and (5) to erect for the members and for society at large a holy place of transcendental pastimes dedicated to the Personality Krsna. The first two items were realized with the publications of Srila Prabhupada’s books and Back to Godhead, and hundreds of people felt within themselves the actualization of the third item. The fourth item was boosted by the organization of the sankirtana (street chanting) party of the West Coast and eventually in some fifty cities around the world where temples were established. And the last item we were to realize two years later with the establishment of the New Vrndavana community. So 5,000 of the prophetic handbills were printed up, and we went about to distribute them. And he went on in this way. Srila Prabhupada didn’t say a word. Kirtanananda finally ran down, and Srila Prabhupada asked, “Are you finished now?” When Kirtanananda acknowledged that he was, Srila Prabhupada suddenly began to roar like the lion incarnation. “Krsna is standing right before you and He says, ‘You worship Me,’ and you mean to say you do not worship Krsna? You mean worship some void, unborn? Krsna is before Arjuna and He says, ‘On Me fix thy mind. To Me be devoted. Worship Me!’ You do not understand? A nonsense rascal says it is not to Krsna, so you want to worship such a nonsense rascal? ‘Not to the personal Krsna,’ he says, and Krsna says, ‘Worship Me. '” We all sat in shocked silence. Kirtanananda didn’t say another word. I remember that I thought this attack very harsh, but Umapati thought it was justified. “He’s right,” Umapati said afterwards. “None of the commentators mention worshiping Krsna, but Krsna clearly says, ‘Worship Me.’ You’ve read Bhagavad-gita before. Have you ever thought of worshiping Krsna?” I had to admit that although I had read Gita three or four times before, worshiping Krsna had never entered my mind. Later I came to understand that most scholars and swamis avoid the clear command of this verse, although they teach from Bhagavad-gita. Indeed, the following year in San Francisco I bluntly asked one celebrated Swami Mayananda, “Do you worship Krsna?” He was sitting in a chair, and I was standing over him when I asked the question, and he jumped to his feet and shouted, “No! Why should I?” His eyes flashed, and he was furious and he chided me that Krsna is nothing but the Self that is within all of us. We all felt that we had just touched something very hot. Certainly no one doubted that our long slumber had been disturbed.